People have custom homes designed for a variety of reasons, but most often because they cannot find a stock plan that suits their particular needs or the specific requirements of their lot. Spectacular view lots requiring that the view be fully utilized, steeply sloping lots which do not allow conventional house types to be easily used, special floor plan configurations requiring particular room arrangements to satisfy your lifestyle, a building lot with covenant or easement restrictions, these are all factors which may dictate the need for a custom design. In designing your home we have a well established format that has been developed over time to not only simplify the process, but also to ensure that we have the best possible chance of satisfying all your needs. In order to prepare for our first meeting we suggest that you do some "homework" so that you are better prepared to accurately convey your needs. measure the room sizes of your current house, or have a copy of a plan that you like that reflects the room sizes you prefer. measure the items of furniture that you will be re-using. We want to make sure that everything not only fits, but does so in a functional way. if you property has desirable views, consider which rooms you wish to take best advantage of those views. In this regard also consider where the best use can be made of available sunlight and how to integrate the sun and views to best advantage. give serious thought to your own needs- what rooms do you really want or need- how many bedrooms or bathrooms - how should your Kitchen be arranged, etc. get a series of photographs that reflect the exterior "character" of the house that you are after. These should be in context, an eighty foot wide house on a forty foot wide lot obviously does not work. A good idea is to look around your local area as these houses should reflect what is possible under the bylaws in your area. give some thought to the heating system you want as different types of heating can have an impact on your overall building height, and a change half way through the process may result in height problems at the city. have information with regards to any Restrictive Covenants that may be applicable to your property. Following our initial meeting we will prepare some preliminary sketches for your review. We will review these together and revise them until you are satisfied. If you are working with a builder this may be a good time to get some preliminary budget estimates just to be sure that costs are not going to become a factor. 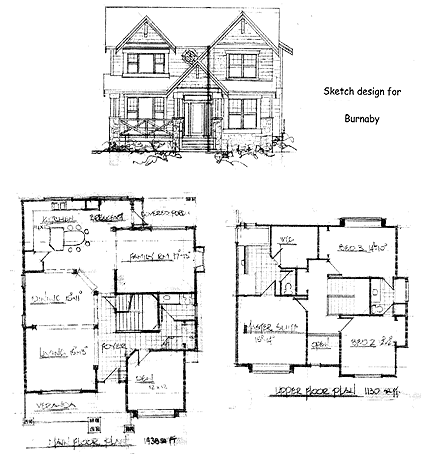 Once the sketches are approved we will proceed to working drawings which eventually become drawings for your building permit. We usually have at least one more meeting when these drawings are almost complete just to review things to make sure everything is the way you want it to be. It is during this phase that you may want to consider the 3D option so that you are better able to envisage just what your home will really look like. Drawing Scale: Drawings are done in a scale of 1 / 4" = 1'- 0"
Exterior Elevations show the front, rear and side of the house including exterior materials, finishing details, window locations. Framing Floor Plans show the placement of walls and the dimensions for rooms, doors, windows, stairways, etc. for each level of the house. Shows the pitch and layout of the roof. Foundation Plans show either a basement, crawlspace or slab depending on the design. The foundation plan details the layout and construction of the foundation. Cross Sections shows details of the house as if it were sliced from the roof to the foundation. The cross sections detail the construction of the home, insulation, flooring and roofing. Provides instructions and information about any combinations of the following: structural specifications, excavating and grading, masonry and concrete work, carpentry and wood specifications, thermal and moisture protection, and specifications about drywall, tile, flooring, glazing, caulking and sealants. Once the plans are completed you will need to forward the drawings to a structural engineer prior to submitting drawings for building Permit. If you have a particular builder in mind you may want to find out the contact information of the Engineer that he generally uses, if you do not have an engineer in mind we are able to provide you with engineering details.